I first met 46.10/22 in an overcrowded drawer, mixed in with pottery from former excavations at the site of Jericho, from the modern-day Palestinian Autonomous Authority. Jericho itself is the stuff of legend – notorious for its trumpet-sensitive walls in the Book of Joshua (Joshua 5 – 6), from which account we derive the desire to ‘wish someone to Jericho’. But it has taken on other resonances in modern culture: as a tourist destination, the theme of a song by legendary 70s band Stray, or reinvented for television as a spy thriller and now an American town at the centre of a post-apocalyptic drama. Its also been the home of a few archaeological ‘discussions’, including a rather entertaining debate in 1990 between Manchester Museum’s Piotr Bienkowski and biblical archaeologist Bryant G. Wood (“Jericho was Destroyed in the Middle Bronze Age, not the Late Bronze Age”, Biblical Archaeology Review 16.5, 45-6, and “Dating Jericho’s Destruction: Bienkowski is Wrong on all Counts”, Biblical Archaeology Review 16.5, 45-9). So where does this simple body sherd fit into this legend? Well, at first sight it appeared to be a fairly average looking fragment from the neck and shoulder of some kind of storage vessel. The excavator had marked the interior with its field context, now visible only under raking light, which tell us that it was excavated by John Garstang in 1931 from a dump along the inner north west face of a tower at the site. It was only on turning it over that I discovered it to have an unusual addition to the usual form. There it was. A rather charming hand applied to the vessel wall. 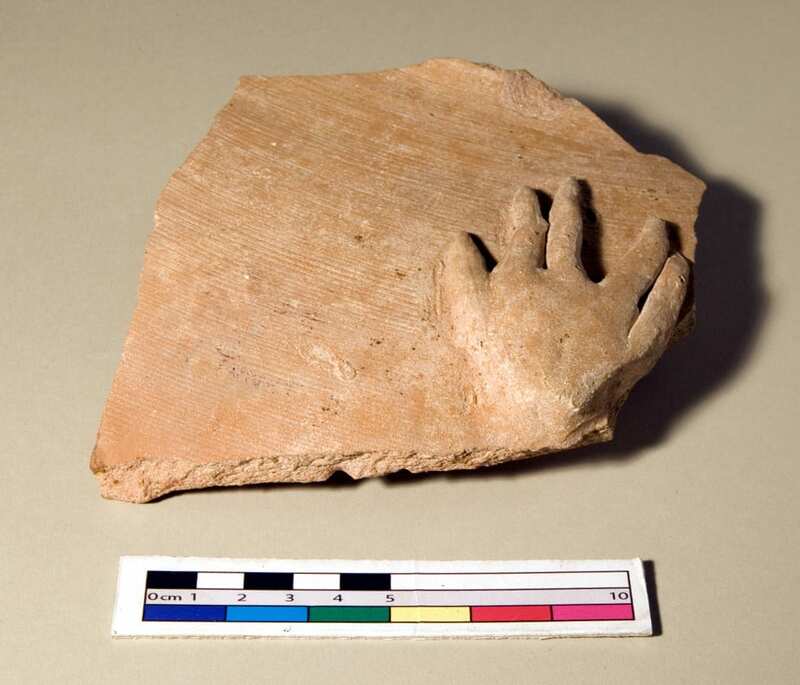 Well, I’m a fan of pop culture myself, so my immediate thought was that there had been a bit of jiggery-pokery by a Star Trek fan with a time machine and a talent for working clay, to produce what looked like a fine representation of a Vulcan hand salute. Actually, the link is not as far-fetched as first seems; the Vulcan hand sign was supposedly invented by Leonard Nimoy, inspired by a hand gesture used in temple to represent the Hebrew letter shin. 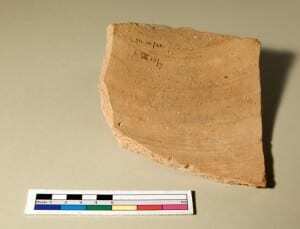 This is an Iron Age sherd, from the Hebrew Kingdom of Judah, so maybe the ancient potter intended the same thing. Or maybe the placement of the fingers is just coincidence. What we don’t know is how this element related to the rest of the vessel. Was there a matching hand? A modeled face or head between? It is an intriguing possibility. This piece represents something else: the tension between my curatorial role at UCL and my archaeological background. The curator in me revels in the rare and unusual; who wouldn’t want to be able to claim that they have a unique object in their collections? These are the things that excite visitors and raise our public profile. On the other hand, as an archaeologist I prefer to work with groups of similar objects rather than one-off aberrations. The more examples we have of an object type, the more complete our understanding becomes of how that object fitted into its parent culture, in both time and space. In this context, 46.10/22 is something of a tease. 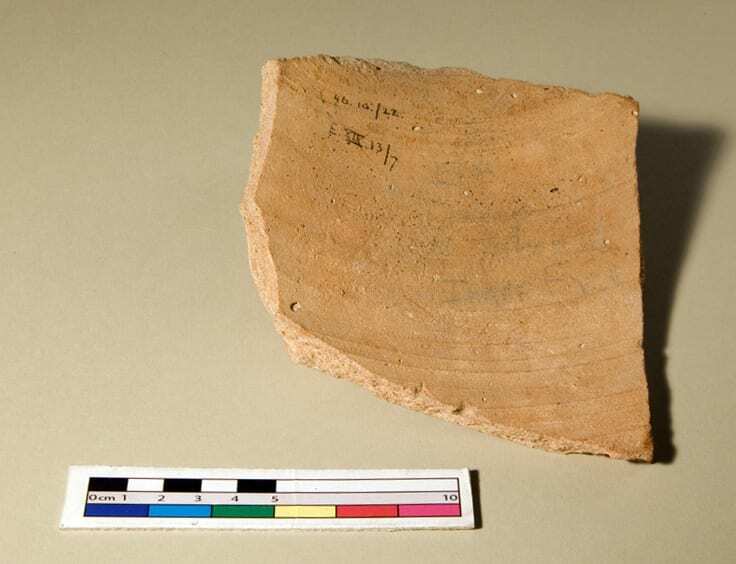 I’ve never seen another sherd like this one, so I’m not really sure what to make of it. Its archaeological context would appear to be secondary, with the object having been broken and thrown away, leaving a whole lot of questions unanswered. Who used this vessel, and what did it mean to them? Was it some special commission, or were more of them made? And did the odd position of the fingers hold any particular meaning, or are we trying to read too much into what we see here? It looks as though the mystery will remain a little bit longer. Maybe somebody out there has seen something similar, in their museum or in the field. If you have – I’d love to hear about it. And in the meantime, may you all live long and prosper …. Fantastic post and excellent find! I’m really happy to see such a fun mix of pop culture, archaeological insight, and UCL’s hoard of amazing finds. Some of the best museum digital outreach I’ve seen. Cheers! How idiotic, when asked by producers to come up with a hand signal for the Vulcan people, Leonard Nemoy selected one from his religious upbringing and one that had been used for thousands of years but would still be new to most people (if they too were no Jewish) since both lead actors were Jewish as well as the shows producers and creators they willingly accepted this sign and now it is more known from the show then from the thousand years of history.